1. Where did you get the idea for the book? 2 Will there be a second book to this (or is there)? 4. What are some things that inspired you to write? 1.) I got the idea from a dream, which now has few similarities to the finished product, but the gist of the dream was that two very powerful people who were in love had been manipulated into starting a war against one another. The dream ended with the woman fighting her way to the man and killing him, not because she wanted to, but because she'd been coerced into doing it. That idea grew, and eventually it turned into the catalyst that started all of the events in Fire Heart. 2.) There will definitely be a second book, and a third. I'd originally told my readers that the second would be out either late this year or early next year, but I think that might have been too optimistic an estimate. 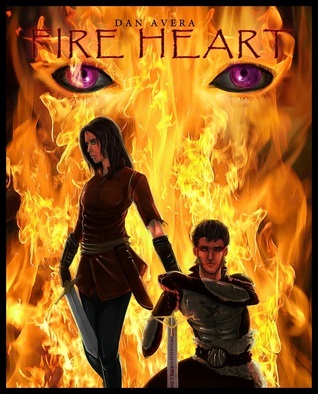 If people are interested, though, they can visit my website at danaverafireheart.wordpress.com for updates on Book Two as well as cool Fire Heart artwork from Feli Pugliese, who did my cover art. 3.) I've been writing my own stories as a hobby since I was about sixteen, I think, but I've always enjoyed writing. I just didn't realize until halfway through high school that it was my favorite thing in the world. 4.) Well...there are a lot of things. The thing that got me on the fanfiction site was the notion that I could write better than the established authors (not nearly as true as I thought it was). I've always loved stories, especially fantastical ones, but there came a point where I couldn't find any stories I wanted to watch, read, or hear. They just didn't exist the way I wanted them to, so I decided to make them. I think that was the biggest thing that drove me to write, and continues to drive my storytelling - the need to be able to tangibly experience a story that only exists in my head. Does that make sense?